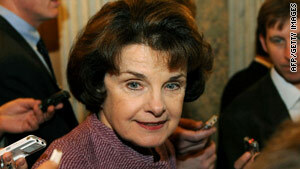 Sen. Dianne Feinstein called the current standard "too restrictive" and urged that it be changed. Washington (CNN) -- Sen. Dianne Feinstein called Wednesday for President Obama to reverse a policy established last year that kept the suspect in the Christmas Day botched jetliner bombing from having been placed on a no-fly list. The failed bombing "is a reminder that attempts to attack the U.S. homeland continue and that al Qaeda and affiliated terrorist groups are searching for new ways to use explosive devices and operatives that will not arouse suspicion in order to carry out attacks in this country," the California Democrat wrote Wednesday in a letter to the president posted on her Web site. "We must therefore adjust to meet these developments and stay ahead of them." The chairman of the Senate Select Committee on Intelligence said that the U.S. government was warned about the radicalization of suspect Umar Farouk AbdulMutallab, 23, of Nigeria, more than a month before he flew from Nigeria to the Netherlands and then to Detroit, Michigan. "Yet apparently no action was taken other than to put Mr. AbdulMutallab in the Terrorist Identities Datamart Environment. He was not placed on a No-Fly or Selectee List for additional scrutiny and screening, nor was action taken to revoke his visa," Feinstein said. A U.S. government official said the United States had intelligence more than a month before the attack -- between August and October -- that extremists in Yemen were discussing operations; that someone known as "the Nigerian" was mentioned; and that U.S. intelligence had a partial name, Umar Farouk. Federal authorities have charged AbdulMutallab with trying to detonate explosives hidden in his underwear as the flight made its final approach to Detroit. The device failed to fully detonate, instead setting off a fire at his seat. Feinstein said she understood that AbdulMutallab wasn't put on a no-fly list because of a policy established last year during the administration of George W. Bush, "that limits the circumstances under which the government adds an individual to the watch list." She called the standard "too restrictive" and urged that it be changed. "The U.S. Government should watchlist, and deny visas, to anyone who is reasonably believed to be affiliated with, part of, or acting on behalf of a terrorist organization," she said. A U.S. counterterrorism official who asked not to be identified said the change to which Feinstein was referring was "designed to provide a clear, government-wide standard" for putting an individual on a terrorist watch list. Before the change, law enforcement, intelligence and homeland security agencies and departments involved with the list "applied moderately different standards," the official said. The 2008 change "made it a universal standard." But the official said the change did not make it more difficult to get a name on the watch list and represented the collective thinking of the nation's intelligence agencies. It was not clear who had sought the change, said the official, who would not comment on Feinstein's letter. "TSC accepts nominations into the Terrorist Watchlist when they satisfy two requirements," he said. "First, the biographic information associated with a nomination must contain sufficient identifying data so that a person being screened can be matched to or disassociated from a watchlisted terrorist. "Second, the facts and circumstances pertaining to the nomination must meet the 'reasonable suspicion' standard of review established by terrorist screening presidential directives. Reasonable suspicion requires 'articulable' facts which, taken together with rational inferences, reasonably warrant a determination that an individual is known or suspected to be or has been engaged in conduct constituting, in preparation for, in aid of or related to terrorism and terrorist activities, and is based on the totality of the circumstances. "Due weight must be given to the reasonable inferences that a person can draw from the facts. Mere guesses or inarticulate 'hunches' are not enough to constitute reasonable suspicion." The recommendation came as the administration briefed congressional staffers in private meetings on the matter. But several who attended told CNN Correspondent Candy Crowley that they learned little. Congressional hearings are slated for next month. Complaints also emerged Wednesday over how federal authorities handled the matter once it had occurred on Christmas Day. The Department of Homeland Security alerted 128 flights that were then en route to the United States from Europe and told them to take security precautions, CNN's Jeanne Meserve reported. But more than 3,000 other flights that were in the air at that point were not alerted, which drew criticism from some who asked why the department had concluded that they, too, were not at risk. Though it was not clear whether al Qaeda was involved in the failed Christmas Day attack, the terrorist organization's hallmark is to launch nearly simultaneous attacks, as occurred during the Sept. 11, 2001, attacks on the United States. Michael Chertoff, who served as secretary of the Department of Homeland Security under the Bush administration, urged caution in apportioning blame. "I don't think we have the full picture," he told CNN. "I don't want to rush to judgment." He said security officials cannot count on perfection and therefore have created a layered security strategy "so that even if one fails, another one gets picked up." Chertoff, who works as a security consultant for companies that make screening devices that can identify explosives hidden under clothing, urged that such machines be deployed more widely. The devices are opposed by the American Civil Liberties Union and privacy advocates. And, noting that British authorities revoked AbdulMutallab's visa this year but did not inform their U.S. counterparts, Chertoff urged that information-sharing between countries be made more open. "We've got to go back to the European Union and fight this fight all over again and tell them that their exalting privacy over security could very well have resulted in tragedy for Europeans as well as Americans," he said.